What’s your definition of an extended luggage carrier? err… we mean trailer. Of course, you can opt for a car over a motorcycle loaded from top to bottom with luggage. But what if you could ride cross country, munch endless miles, and spare them smiles with sufficient luggage behind you and still be comfortable? If so, you’ve come across the correct article. Here’s an example of what a fine blend of engineering and wisdom can do. Calculated measurements, a firmly designed truss, neat welding and a hinge are a few key members to this one wheeled moto trailer fabricated by C-way. We bet you’d be impressed by this one wheeled carrier as it’s both practical and looks cool as well. An ideal motorcycle can carry two panniers, one on each side, and a top box mounted behind the rider. And that’s all the extended space you can have for your precious luggage. But this C-way built one wheeled carrier lets you carry not one but four panniers apart from the two attached on either side of your bike and the top box. Yes! 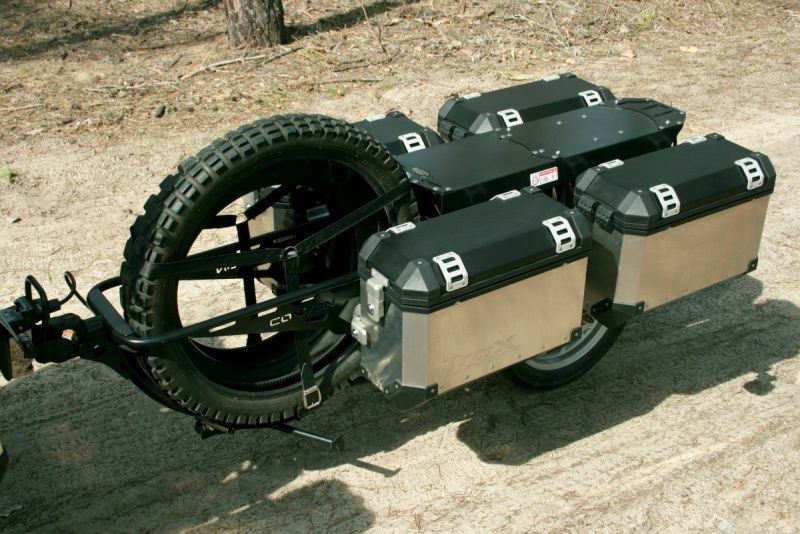 Four carriers, all mounted on a neatly fabricated structure consisting of a truss, a tyre mounted on an alloy wheel, a mono shock to absorb the bumps and a hinge to keep the trailer one with the bike. Though the trailer acts an extended tail of the bike, it adds up massively to the practicality and luggage space. Two panniers can be mounted on both the sides of the horizontal line of the trailer and two adequately sized compartments with a dual phone charger sits in one of them. This trailer is attached to the bike via a hinge mechanism and is completely detachable. So if the trailer has only one wheel and is detachable, how would it stay up? Break no sweat, the trailer comes with a stand to keep it upright and for your luggage to not lay on the ground. Further, the trailer comes with a monoshock to absorb the bumps and not let them transfer to the body of the carrier, this interim keeps your fragile luggage and your gadgets intact, inside the panniers. The trailer also features a tyre rack that can hold up two tyres easily and intact. What more can one expect from this? We guess that’s all. Oh, don’t worry about the movement, the trailer moves with the motorcycle and also has a reflector attached at the rear end to let the traffic behind know about your presence.